I LOVE this Shimmer Satin Apple Ribbon!!! Such a beautiful color, and the shimmer is GORGEOUS!!! I also used the Snowflake Ribbon once again along with more Cherry Baker's Twine. I'm telling you, this stuff rocks! I love those colors! The snowflake ribbon is really great! love the image on the card it is just so darn cute... great card & tag... i really need to use ribbon on my projects, it gives it such a nice look! I love both your card and your tag !!! Became a follower at once !!! Great card and tag Kerri. Your coloring is amazing on that cute image!! The snowflake ribbon is just perfect with the dp you used. Awesome!!! You coloring skills are crazy mad Kerri. Love that bow too. Thanks for all of your hard work on the team. Oh wow!! What a really beautiful card and tag Kerri. I love the colors you used and those ribbons are just GORGEOUS!! That image is soooo sweet!! Adorable card! Great coloring!!! Love the tag too. Another adorable image! So cute and the touch of twine makes it so fun. Love how well they coordinate with each other! 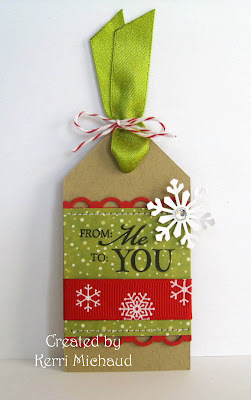 This snowflake ribbon is just wonderful, and your cards and tag as well, Kerri ! Thanks for sharing. Pretty card! I'm a newbie scrapbooker but I thought about making my tags this year! :) Thanks for the idea. great card and matching tag love them both.. and the snow flake on the tag is such a nice touch! thanks for sharing. Love your card and tag...love the colors too. Your coloring is wonderful. Thanks for sharing your work with us. This is stunning Kerri!! I so love your coloring and the colors of your card. Too cute!! Gorgeous ribbon!! Your tag is stunning too!! That little bear card is about the cutest thing EVER! I love the greens you chose. Fabbie! Love your card and the snowflake ribbon is perfect on it. The tag with the twine and the green ribbon would be great for a special person's gift. Very festive! Gorgeous Kerri,I love the image and your papers. I love your card and your tag! They are woderful. Great work! I love your creations. OH WOWWEEE Girl these are both sooooo fab!!!! Great work again Kerri!!!! FABULOUS! Kerri, Your projects are just adorable! It's been so fun being on this DT with you! Love the colors on your card and tag--both of which are so pretty! I love tags also and yours is so pretty!!!! Both projects are adorable and so is this ribbon set! Love it! button in a bow..............geesh I still have to try that! Great Christmas card & that TAG is perfect! love the brown/krafty base!! Cute tag. I love the red snowflake ribbon and your color combinations. Kerri your creations are fabulous and your bow is perfect on your card! Love them both! Love your card and your tag! Think you did a wonderful job with all that ribbon! Thanks for all lovely inspiration you share. I love it when you use that square scalloped Nestie and then layer a square image on top of it - - it's a great look...and your coloring of course - just the bestest. I am on a major twine kick these days too. Love your projects....esp that card...the bear is so cute and love your coloring. Hi Kerri! I looove your card, it's too cute ;) Such a cozy bear :) Great coloring, papers and layout - and the ribbons fits perfect!! Very cute card and tag. Love the green dotted dp looks very snowy! Both are fabulous! I'm into tags right now too. Ooooh, How cute is this little bear! I am so glad that you got this stamp and created a wonderful Christmas card, Kerri! I really like the snowflake ribbon! Tag is so beautiful! I really like the snowflake you added and green ribbon! Can't get any sweeter than this! Soo cute Kerri, love the traditional Christmas colors! This is the perfect Christmas card. Love those colors. Thanks for the inspiration. This is the cutest card ever!! This is too sweet Kerri! 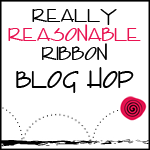 Love that adorable image and fabulous ribbon! Love your card and tag ! What an adorable set! I just love your coloring on that little bear. Would you mind telling me which copics you used for that soft brown? Thanks for sharing your wonderful artwork! !